Mangaka of Gakuen Noise sees many similarities between his work and the anime Kill la Kill. Studio Trigger's Kill la Kill is one of the more popular anime of the season. 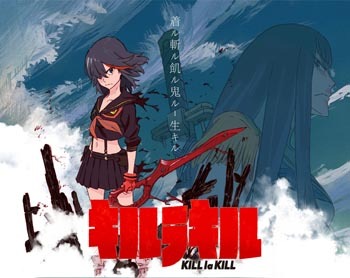 With a determined and rough protagonist, clothes-based combat system, and a rigid student council that takes away students' freedoms, Kill la Kill has been accused of plagiarizing an older and somewhat similar work, a manga called Gakuen Noise (otherwise known as Campus Noise). Hiroyuki Ooshima and Daisuke Ihara created Gakuen Noise over a decade ago. The protagonist seeks to avenge a deceased friend and fights against a scheming student council that wields control over a boarding school so large that it functions as a town. Anyone who has seen Kill la Kill recognizes that the show's premise sounds quite similar to Gakuen Noise. The protagonist of Kill la Kill pursues a school council president whom she suspects killed her father, and she's vowed to get revenge. The school council of Kill la Kill controls a town and decides which students live where - students who contribute to the school and perform well are awarded special uniforms and residence in higher class areas while other students live in a shantytown. Ooshima, who now lives in France and works in the French comics industry, suggested in a blog post after watching a Kill la Kill trailer that the anime plagiarizes his work Gakuen Noise. Ooshima was upset and said he had symptoms similar to PTSD after watching the trailer. He believes Kill la Kill did not use Gakuen Noise as inspiration but as a work that's unoriginal. He wrote that there have been authors who have borrowed elements from his work, but he adds, "all their works were full of originality and can't be compared to Kill la Kill, and I don't think of complaining about them." Gakuen Noise is an obscure manga - old and unknown, which Ooshima argues makes it easier to plagiarize without consequences. Ooshima's partner in creating Gakuen Noise does not feel the same. Ihara notes that while there are similarities between Gakuen Noise and Kill la Kill, he argues that the latter's story is different and will head in a different direction. (Kill la Kill is halfway through its run.) Ihara's definition of plagiarism is "tracing the pictures and completely mimicking the story development." Gakuen Noise is available to read in Japanese, and anyone interested in similarities between the two works can look for themselves.